Dealing Members are hereby notified that additional 745,234,886 ordinary shares of May & Baker Plc (May & Baker) were listed on the Daily Official List of The Nigerian Stock Exchange today, 24 January 2019. The additional shares listed arose from May & Baker s Rights Issue of 980,000,000 ordinary shares of 50 kobo each at N2.50 per share on the basis of 1 new ordinary shares for every 1 ordinary shares held as at 4 September 2018. The Rights Issue was 76.04% successful. With this listing of the additional 745,234,886 ordinary shares, the total issued and fully paid up shares of May & Baker has now increased from 980,000,000 to 1,725,234,886 ordinary shares. 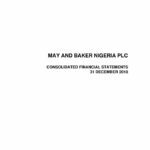 May and Baker Nigeria Plc (the Company) filed an application for a Rights Issue of 980,000,000 ordinary shares of 50 kobo each at an offer price of N2.50 per share on the basis of one (1) new ordinary share for every one (1) ordinary shares held as at the close of business on Tuesday, 4 September 2018. May & Baker Nigeria Plc manufactures and markets a range of pharmaceuticals, vaccines, medical diagnostics, foods and consumer healthcare products in Nigeria. Pharmaceutical products include anti-diabetics, anti-infectives, anti-malaria, analgesics, cough & cold treatments, multivitamins and anxiolytics. May & Bake Nigeria Plc produce a range of Mimee noodles and Lily still water. The company’s head office is in Lagos, Nigeria. May & Baker Nigeria Plc manufactures and markets a range of pharmaceuticals, vaccines, medical diagnostics, foods and consumer healthcare products in Nigeria. Pharmaceutical products include anti-diabetics, anti-infectives, anti-malaria, analgesics, cough… READ MORE.